The mirrors on a motor vehicle, both side and rear view, allow the driver to observe what is happening in the vicinity of that vehicle. In addition to the human eye, they are a driver’s most important visual aid and thus vital for road safety. They do a good job, but are they enough? Cars and commercial vehicles have increased exponentially in size, but our roads and parking spaces have not. This makes driving a more difficult exercise than for road users of as little as twenty years ago. All motor vehicles inherently have what are known as blind spots, which is why they are fitted with rear-view and side mirrors; but they do not adequately cover all eventualities. Objects seen in mirrors can often be closer than they appear especially if the glass is convex, as is usual on the front passenger side of the vehicle. Mirrors do not offer 360º coverage; thus, other vehicles at some point possibly during an overtaking manoeuvre will be out of a driver’s vision. That’s a blind spot, and all vehicles have them. What Does The Term Blind Spot Mean For A Driver? 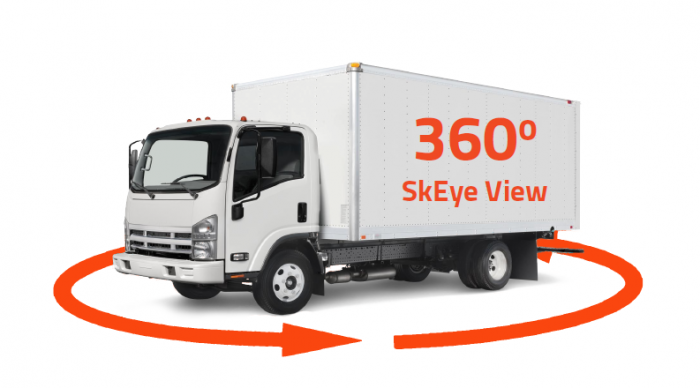 360 SkEye View provides fleet drivers with all-around visibility of the vehicle’s surroundings in a single view. In the driving seat of a motor car, our vision is clear, and we can see any dangers, but that’s not the whole story. It isn’t just pedestrians crossing behind the car either. Other vehicles approaching or stationary objects can all be an accident waiting to happen as any person who has reversed into one of those small concrete bollards can tell you. Blind spots extend around the back of the vehicle. Even the most attentive driver could miss, say, a small child directly behind the rear bumper. Many modern cars these days have reversing devices or cameras to alert the drivers of potential hazards at the rear of the vehicle, but imagine how much more difficult it is for a truck driver to commit to similar manoeuvres. All drivers in following cars have seen a notice appended to the back of trucks with the message, “If you can’t see my mirrors then I can’t see you”. In short, the driver cannot see anything directly behind his vehicle. It is worth bearing in mind too that, with vans, lorries or other large transport vehicles blind spots can equally apply to the front of the vehicle. The front blind spot is due to the height of the driver’s cab and also to the left and right windscreen pillars. The largest blind spot on a truck is behind the vehicle and slightly to the passenger side. Additional blind spots include right below the passenger door, anything below six feet tall in front of the truck for about nine metres, and finally, directly behind the truck. Recently, researchers analysed a whole year’s worth of HGV accidents on occasions when it was clear that blind spots were a factor. They found that, while only 5% of those accidents occurred in the front blind spot, the accidents nevertheless accounted for a staggering 30% of the fatalities. Accidents in the rear blind spot accounted for twenty-five per cent of fatalities, followed by those in the near-side blind spot specifically when vehicles are turning – this is where cyclists are most at risk. Accident figures for the UK in 2012 for commercial vehicle variants involved 450 for Heavy Goods Vehicles, 155 for Light Goods and 130 for public service transport. Of these, in just that one year, 21 involved fatalities. Fleet owners and independent operators have a duty of care to their staff and the public at large. The larger the vehicle, the higher the risk of blind spots, the more the need for blind spot awareness. Today, our vehicles have never been safer and are bristling with the latest technology, yet road users still have a long way to go before they see the truly autonomous car that protects us from all potential accidents. In the meantime, motorists must fend for themselves. Those car drivers not fortunate enough to afford the very latest in new car technology options or commercial vehicle and fleet operatives for whom safety is paramount have the option of purchasing excellent after-market devices, such as backup or reversing cameras and CCTV equipment to support driving vision. The increase in the availability of advanced driver assistance systems (ADAS), either supplied with a new vehicle or as an after-market purchase is a big step forward. ADAS relies on inputs from multiple sources, including automotive imaging, LiDAR and radar and most drivers are aware of this as part of modern safety features. Included are, variously, automatic emergency braking, traffic warnings, close vehicle alerts, and lane departure warning amongst others and, in some cases, blind spot alerts. Until we can truly rely on autonomous technology, there is still room for more, especially where large commercial vehicles are concerned. This is where CCTV systems can help. On-board CCTV helps eliminate blind spots and make the manoeuvring of vans and trucks safer. Cameras can be mounted externally on the rear, sides and even on the roof, protected from both the weather and casual vandalism and come in a variety of types to suit individual requirements. In addition to security and insurance matters, CCTV can provide all-around blind spot coverage, alerting the driver in-cab. It has already been shown that such systems have reduced road traffic accidents of all types by forty per cent. The old driving instructor adage of ‘Mirror. Signal. Manoeuvre.’ is as valid for drivers today as it ever was; more so, possibly. If however, we are to save lives on our roads the technology is available now to protect ourselves and other road users so perhaps it is time to add a fourth commandment: Camera. For more info on 360 SkEye View please contact us via the form here. Alternatively, you can call us on +44 (0) 800 368 8175.